This is the perfect time for the decadent chocolate Bundt cake drizzled with luscious chocolate ganache! Well, no time could be imperfect for this heavenly chocolaty delicacy! I am not a regular baker, even though I love to see baking videos! I bake seldom but when I do I want it to be a grand event! Today’s chocolate Bundt cake with chocolate ganache is no less than a grand event! If you have already scrolled down and watched the video, (‘Thank you for watching!’) then you must be already drooling over that drizzling chocolate ganache! We also couldn’t stop staring at it! Chocolate ganache is such a wonderful thing that it takes any simple chocolate cake to a whole new level! You will always reach for another bite of the cake just because of that addictive ganache and I can give this to you in writing! 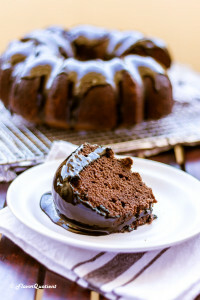 Chocolate Bundt cake is a very easy way to alleviate a simple chocolate cake to a piece of art. You don’t even require any extra effort except for buttering the pan generously which you anyways have to do for any other regular cake pans only difference being that you need to carefully coat each and every nook and corners of the Bundt pan. Bundt pans are little more prone to sticking, so if you get the greasing of the pan right, you are sorted. I dusted my Bundt pan with cocoa powder to give additional chocolaty kick to my chocolate Bundt cake; but you can use flour as well for dusting. 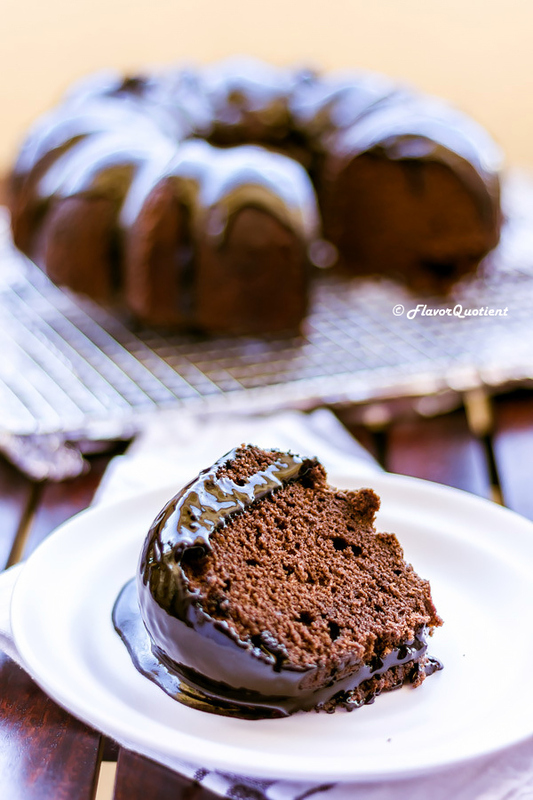 This chocolate Bundt cake has a very rich dense texture with a melt in mouth smoothness. My favorite home-baked cake till date was my best ever sponge cake; but this chocolate Bundt cake is definitely a close competitor. Baking itself is therapeutic and when you bake a rich chocolate cake like this one, your house will smell like that popular bakery in your city; then don’t blame me if strangers start knocking at your door to have a bite of this freshly baked chocolaty goodie! This chocolate Bundt cake is also a good option for gifting this holiday season; I mean, com’on, who wouldn’t like such delicious home-baked chocolate cake as a gift! I definitely would! 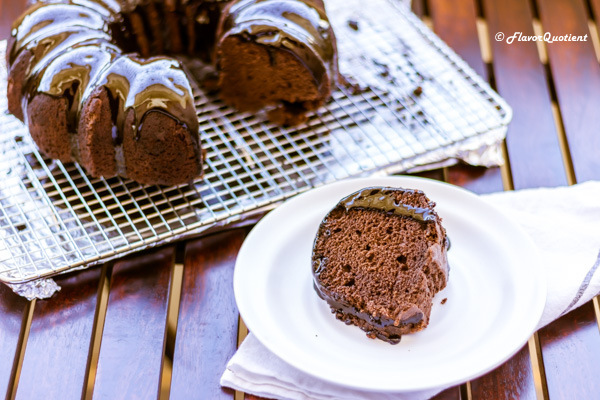 For making this chocolate Bundt cake, make sure to use a good quality cocoa powder. Not all cocoa powder produces the same result and I have come to this conclusion from my first-hand experience. Try the cocoa powder which is specifically meant for baking and not for drinking with milk. Cocoa powder is the main flavor of this cake and you have to get it right without fail. If you don’t have a Bundt pan, do not worry. Use a large square or round pan for the same cake batter and you will still get the same rich and decadent chocolate cake. Do not forego the chocolate ganache as that’s the star of the dish. Drizzle that melting gold on top of your cake and set on a journey of self-indulgence! Preheat your oven to 160 C / 325 F and set the wire rack at the middle of the oven. 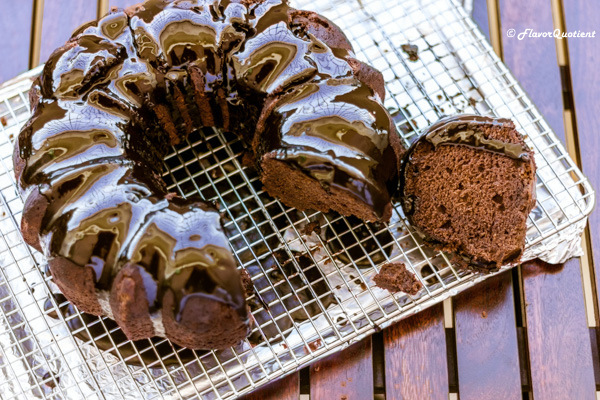 Grease a Bundt pan generously with softened butter and dust all over with cocoa powder. Set it aside until needed. Sift the all-purpose flour in a large bowl. Add cocoa powder, baking soda, baking powder and salt. Mix everything thoroughly using a wire whisk making sure that baking soda and baking powder are evenly mixed with flour. Set it aside. Measure the milk in a measuring cup and add the sour cream to it. Mix them well and set aside. Take the softened unsalted butter in another large bowl; bowl should be large enough to hold the dry ingredients too which will be added subsequently. Add the granulated sugar and beat it with butter using an electric hand mixer or a wire-whisk until the butter turns pale yellow and fluffy. Scrap the bottom of the pan to ensure all the butter and sugar are mixed evenly. Then add the eggs – one at a time – beating them in after each addition. Add in the vanilla essence/extract and whisk in thoroughly. Now it’s time to mix in all three components. Add ⅓ of the dry ingredient i.e. flour-cocoa powder mixture and ⅓ of the milk-sour cream mixture. Beat them in thoroughly. Add half of the remaining dry ingredients along with half of milk-cream mixture and again beat them uniformly. Finally add the last installment of both dry and wet ingredients and beat everything well using the electric hand mixer. If using a wire-whisk, you may need to beat them a longer time. Now transfer the cake batter into the prepared Bundt pan and spread as evenly as possible using a spatula. Bake the chocolate Bundt cake in the preheated oven for 1 hour or until a long toothpick inserted into the center comes out clean. While the cake is baking, prepare the chocolate ganache. Heat heavy cream in a small sauce pan until bubble starts to appear. You don’t need to bring it to full boil. Take the bitter-sweet chocolate in a bowl and pour the warm cream on top. Tip in the softened butter too and keep stirring with a spatula until both chocolate and butter melt and turns into glossy chocolate ganache. If the chocolate it not melting, put the bowl on top of a pot of simmering water and keep stirring. The chocolate will melt from the heat coming from steam beneath. Let the ganache cool down a bit. It will thicken a little as it cools down. Once the cake is fully baked, take it out and leave it in the Bundt pan for at least 15 minutes. Then take it out and place on a cooling rack seated on top of a baking sheet. Drizzle the thick & shiny chocolate ganache over the warm chocolate Bundt cake and let it drip off the sides. Is there any other satisfactory sight than this? I doubt! Serve the cake warm. Enjoy! This cake looks amazing- saw it on Pinterest. Happy New Year from me at G’day Souffle’! Wow! its looks so soft and delicious that turning my eyes away would be difficult. Thanks for such beautiful recipe.